In 1912 Joseph and Martha Ann Parrish emigrated from Wales to Australia and settled in the Newcastle district. Six years later they would lose two of their sons within seven days of each other, both victims of the hostilities on the Western Front. On 16 October 1915 Joseph Parrish jnr joined the Coo-ee Recruitment March at Wellington. 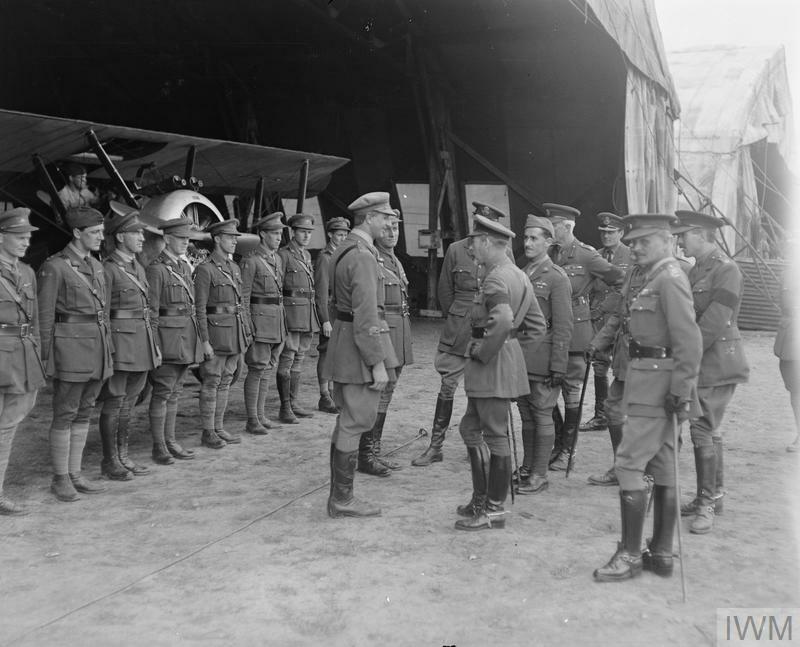 He completed his medical at Wellington, and was attested by Captain Nicholas at Orange on the 24 October 1915. 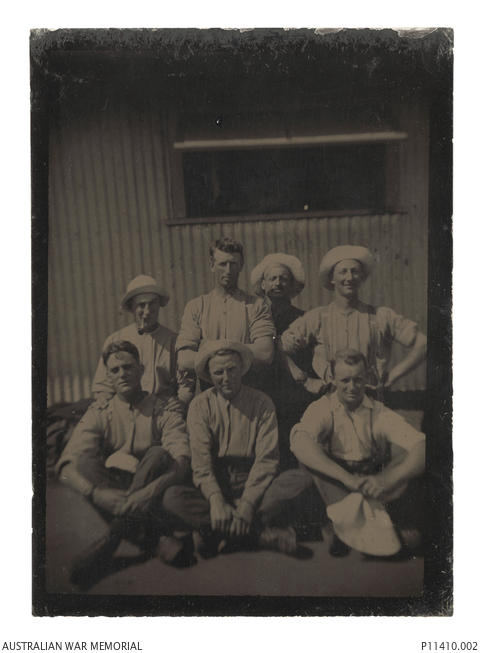 At the time of his enlistment Joseph was living at Creek Reserve, Boolaroo, where he was employed at the colliery. After completing the Coo-ee March Joseph proceeded to Liverpool Camp as a reinforcement for the 13th Battalion. On 8th March 1916 Private Parrish and his fellow Coo-ees departed Sydney on the HMAT A15 Star of England, arriving in Egypt on 11 April. 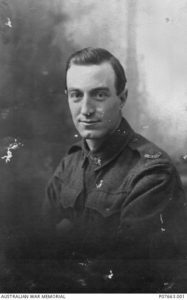 On the 16 April 1916 Joseph was transferred to the 4th Pioneer Battalion at Tel-el-Kebir. Six weeks later, on 4 June, he embarked HT Scotian at Alexandria to join the British Expeditionary Force in Marseilles, France. Private Parrish was transferred to the 4th Machine Gun Company on 12 May 1918. On 10 June 1918 the company was engaged near Villers-Bretonneux when Joseph received a gunshot wound to the neck. He was admitted to 4th Australian Field Ambulance and later transferred to the 53rd General Hospital at Abbeville. Joseph failed to recover from his wounds; he died on 27 June 1918, aged 21 years; the cause of death being listed as gunshot wound to neck and bronchopneumonia. He was buried in the Terlincthun British Cemetery at Wimille. Joseph Parrish is commemorated on panel number 176 on the Roll of Honour at the Australian War Memorial in Canberra. George Henry Goode c1916. Image courtesy Australian War Memorial. In the early hours of 2 June 1918 former Millthorpe grocer, George Henry Goode, was delivering canisters of hot tea to his comrades on the front line at Morlancourt near Villers-Bretonneux when an enemy shell exploded nearby, killing him instantly. George was the second member of his family to die in service; his brother Ernest Harold Goode had been killed in action in February 1917. Born in Millthorpe in 1887, George was the seventh of ten children of farmer William Goode and his wife Elizabeth Grace nee Pascoe. Following his education George worked as a grocer for Messrs W and E Hayes Trade Palace Stores in Millthorpe. George enlisted in December 1915 and was assigned to 17th Battalion, 13th Reinforcements. You are worthy sons of worthy parents. We thought a lot of you before – we think a thousand times more of you now. I trust that your mission will be fully realised. I think the Kaiser is sin personified, and the world should be rid of him. 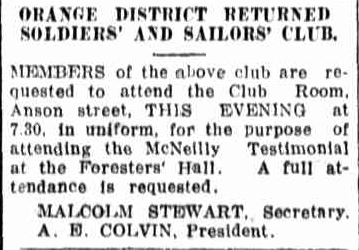 The following morning many townspeople saw the recruits off from the railway station as they set off for camp at Lithgow. On this occasion my feelings are too great for words. These young men are going to fight for their King and country. I am glad that the spirit of their forefathers is strong in them. As instructor of the cadet corps which was here once, I just looked up the records a few days ago to see how many had enlisted, and I find that 24 out of the full strength of 30 have answered the call. Maybe before this terrible struggle is over we older ones will be wanted, and I for one will be there, for I would sooner die a free Britain than live a German slave. Private Goode embarked HMAT A55 Kyarra in Sydney on 3 June 1916. He disembarked in Plymouth exactly eight weeks later, on 3 August 1916. The following month he was taken on strength with the 33rd Battalion, proceeding to France on 21 November. In early March 1918 Private Goode was granted two weeks’ furlough in England. He rejoined his unit on the Western Front on 20 March, where he served for a further ten weeks before he was killed in action. George Henry Goode was buried in the Villers-Bretonneux Military Cemetery at Picardie, France. He is commemorated on the Honour Rolls at the Orange Methodist Church, Millthorpe Methodist Church and on panel number 122 on the Roll of Honour at the Australian War Memorial in Canberra. 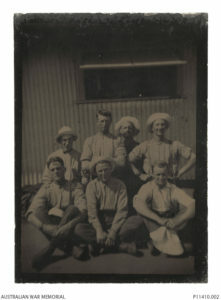 Informal group portrait of soldiers from the 18th Battalion prior to embarkation c23 September 1915. Ernest Goode is in the back row on the far left. Image courtesy Australian War Memorial. On 4 August 1916 Private Ernest Harold Goode was wounded in action at Pozieres in France. A private in the 18th Battalion 6th Reinforcements “Ern” received a gunshot wound to the head amid heavy enemy shelling. Private Goode was evacuated to the nearby 2nd Australian Field Ambulance. The following day he was transferred to the 3rd Casualty Clearing Station, then admitted to the 11th General Hospital at Camiers. On 9 August he was conveyed to the hospital ship HS Dieppe at Calais and evacuated to hospital in England. Private Goode recovered from his wounds; he rejoined his unit in France in November 1916. Ernest was wounded a second time, but this time his injuries proved fatal. On 25 February 1917 he was stretcher bearing at Butte de Warlencourt when a shell exploded nearby killing him instantly. Eyewitnesses claimed that he died from concussion, and that he body was unblemished. Pte. Goode was born locally, spent all his school days here, and enlisted here not very long after the beginning of the war. He bore an unblemished reputation, and an upright character, and was highly respected by all who knew him. Ernest was born in Millthorpe in 1885, the sixth of ten children of farmer William Goode and his wife Elizabeth Grace nee Pascoe. He attended Millthorpe Public School and later took up farming. In July 1915 Ernest enlisted at Liverpool. He embarked for overseas service on 2 November 1915 and proceeded to Egypt, where he served until joining the British Expeditionary Force in France in March 1916. On Sunday 1 April 1917 the Reverend WT Dyer preached his final sermon at Millthorpe Methodist Church. During the sermon he paid tribute to Ernest and the congregation joined in singing the following hymn in his memory. Remember, Lord, Australia’s sons to-night. Remember, Lord Australia’s sons to-night. Wilt Thou prepare them ere they cross the bar? Oh! comfort, Lord, Australia’s sons to-night. On Sunday 9 November 1919 Captain Chaplain Wilson conducted a memorial service at Frape’s Hall at Millthorpe for local fallen heroes, including Ernest. Ernest Harold Goode is commemorated on the Millthorpe Methodist Church Honour Roll and on panel number 85 on the Roll of Honour at the Australian War Memorial in Canberra. Ernest’s brother George Henry Goode also served in WWI; he was killed in action in France on 2 June 1918.